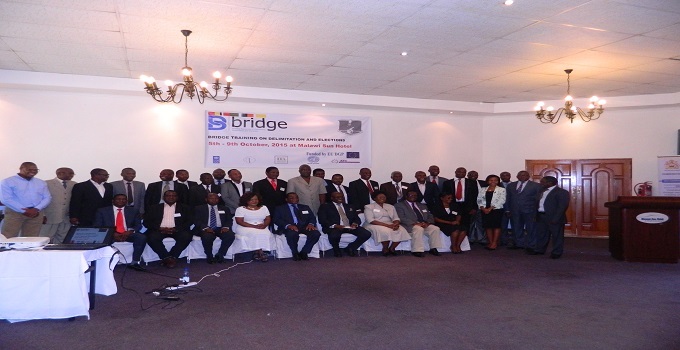 With support from the European Union, the Malawi Electoral Commission has organized a five day training workshop for MEC Commissioners, Secretaries’ General and Directors of Elections from political parties at Malawi Sun Hotel in Blantyre. The training, which started Monday, October 5, 2015 will focus on one Building Resources in Democracy Governance and Elections (BRIDGE) module which is Delimitation and Elections. Speaking during the opening, Chairman of the Malawi Electoral Commission Justice Maxon Mbendera SC said the training was important as it could not have come at a better time than when MEC is preparing to have a thorough demarcation exercise where we are going to redefine wards and boundaries of all constituencies in the country. The course will expose us to various practices around the globe. The law gives powers to the Malawi Electoral Commission (MEC) to determine the number of constituencies for purposes of elections and to undertake or supervise the demarcation of wards. In the case of constituencies, the overriding criterion is that of ensuring equitable representation as MEC is encouraged to ensure that “constituencies contain approximately equal number of voters eligible to register” he said. He added that the last time boundary delimitation was undertaken was 1998, about 17 years ago. This has gone beyond the five-year interval as required by the Constitution. MEC Chairman Justice Mbendera SC thanked the European Union for the support that enabled holding of the training course. The MEC Chaiperson also thanked his my fellow Commissioners, leaders of various political parties and staff from secretariat for availing themselves for this training. He ended his address by encouraging the participants to give their full attention and participation for them to appreciate the benefits and get the internationally recognized certificate of attendance. The training will end on the 9th of October 2015.